Something about brunch entertaining feels easier to me! Maybe it’s because many of the things I generally serve are super easy to make? Maybe because it costs quite a bit less to serve a fantastic spread? Maybe it’s just that it’s a lighter, brighter time of day?!? Many people lean towards dinner when they have people over, and more often they just skip entertaining completely, so I’m here to encourage you to give brunch a try! Now that we’re all coming out of the haze of the holidays, and our houses are being reset to normal, there’s no better way to the start the new year off than having friends over. Set your intention for prioritizing friendship in the coming year: plan a simple yet festive brunch now that people’s schedules have opened up post-holidays. In addition to starting 2019 off on a positive note, it gives us a deadline to get our houses deep cleaned now that the glitter and sparkles are gone (yes, you’re not the only one whose house goals get serious when company’s coming over!). I list out many no fail, low stress menu options below but before we launch into them, I’d like to highlight one key difference in the vibe of brunch vs. other gatherings: I’ve noticed that folks often feel awkward about serving themselves drinks and nibbling on starters/digging into the buffet during brunch more than other meals. Because of this, it’s crucial that you’re freed up from food prep and service enough to greet each guest and break the ice with food and drink immediate offerings. Steven and I often tag team on this—he’ll get them their beverage of choice and I’ll have a tray of a little bite to break the ice. This is especially crucial if you’ve set your drinks up as one of the ‘bars’ below since many folks don’t really know how to make Bloody Marys or Mimosas/Bellinis. Since many people are in diet reset mode this time of year, think through who’s coming and offer a variety of dishes that’ll cover the popular bases like low carb, keto, gluten, and dairy free. A good rule of thumb for brunch menus is a green salad, an egg casserole, or simple prep-ahead egg or protein dish, a side dish &/or sides that complement the egg dish, fruit, 1 carbo-licious indulgence, a light dessert, and 2-3 beverage options. Sample menus below. If you’re serving buffet style, how you display the food is key. Pretty platters, stacked cake plates and crystal bowls take basic, simple foods and make them seem fancy. Think about varying the height of things to take the display to the next level—stacked cake plates are great for this as are napkin-covered shoe boxes under platters or bowls. If your gathering is on the small size, like a Ladies only affair for 6–10, I like seated service because it feels a little more special than buffet with little or no extra effort. Other pros for skipping buffet is that you need less food and can offer egg dishes like baked eggs (which I love) that would end up overcooked if set out on a buffet. Brunch in the perfect time to opt for light, bright, elegant and simple tablescapes and décor. Particularly in winter months it’s a fun way to add a little “Spring” to the day. A few blooms in bud vases scattered down your table or a very small bouquet are just right. No need for elaborate centerpieces—they feel a little overdone at Brunch. And if you want to channel Emily Post a bit and lean towards the traditional etiquette, keep in mind that candles are not lit during daytime meals unless you’d like a subtle scented one burning away from the food and take care to choose a light, clean scent that won’t overpower or conflict with your food. Yogurt bars with 2 options for yogurt (like a great quality Greek plain and vanilla) and toppings like fresh or dried fruit, gluten-free and regular granola, honey and nuts; kids love this option so perfect for a bigger family-oriented brunch. Champagne bars with 2–3 juice options and a couple of garnishes like whole strawberries or orange slices let people create great Mimosas and Bellinis. 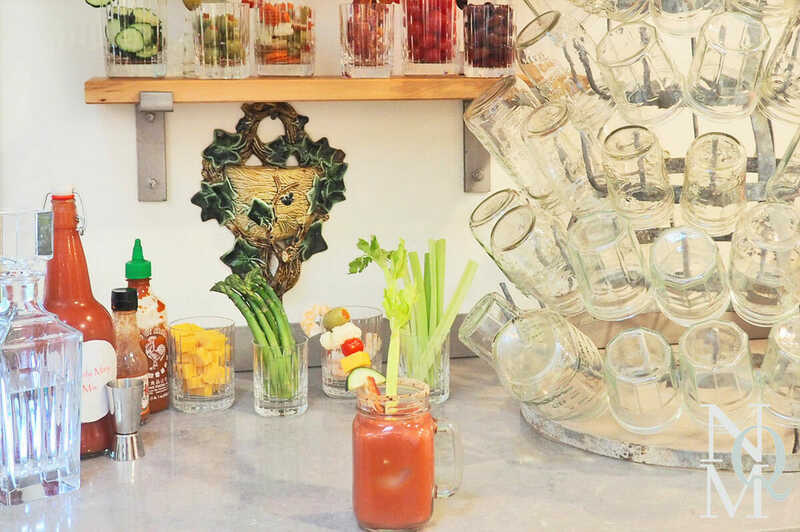 Bloody Mary bars (see the picture below for ideas and scale offering up or down depending on your crowd) and start with a good homemade or store bought spiced up tomato juice; I prefer Emeril Lagasse’s mix which you make the night or day beforehand. Coffee or tea bars decaf and regular, flavored and plain, hot and cold, various sweeteners and creams and voila! Sample Menu 1: Cheesy Egg Casserole, Brown Sugar Oven Baked Bacon, The Pioneer Woman’s Classic Spinach Salad, Strawberries, Pastries or Donuts, light dessert like Ina Garten’s Easy Lemon Mousse. Sample Menu 2 (seated service): Baguette or Brioche toasts with Butter, Honey and Jam, Simple Green Salad tossed with Vinaigrette, Assorted Berries, Baked Eggs (try Ina Garten’s Herbed Baked Eggs or Jo Cook’s super simple Parmesan Baked Eggs which I like adding prosciutto to), Oven Baked Bacon, and a small dessert tray with things like bakery bought fruit tarts, biscotti and high-quality truffles or chocolates. Sample Menu 3: Frittata or Quiche (if buffet offer 1 with meat, 1 vegetable and for seated choose 1 based on guests), Spinach or Spring Green Salad with Vinaigrette, Fruit Salad, or Yogurt Bar including Fruit, Assorted Sweet Rolls or Bagel Bar, Oven Baked Bacon or Chicken Apple Sausages (I like Aidells brand), 1-2 simple desserts like cookies and brownies. Sample Menu 4: Overnight Tex-Mex Egg Casserole served with great quality fresh salsa, guacamole and sour cream, Classic Green Salad with tomatoes, red onions and any other topping you like along with a creamy taco salad dressing or homemade ranch, assorted berries, oven baked bacon, 1 small chocolate pastry option (note: the egg dish is on the hearty side and has a bolder flavor so chocolate pairs well, just keep the portions on the small side) or a small cheese danish, easy dessert like brownie bites, biscotti or cookies. No matter what you choose menu wise, relish the make ahead options, savor the relaxing vibe that brunch offers and soak in your grateful friends during this great break to the often house bound time of year! It’s a perfect way to feed relationships and connect with friends. *This contains links which are purely information – listed only to help you; No Qualms Mom has no affiliate relationship with them.